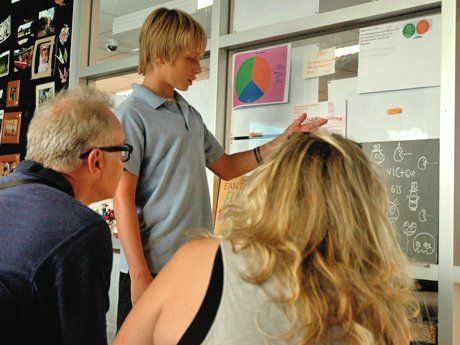 Student-led conferences turn the traditional parent-teacher conference on its head by making students the liaisons between school and family, and drivers of their own education. Editor's note: This post is co-authored by Gabrielle Smith, Dean of School Culture and Community at Washington Heights Expeditionary Learning School. At Washington Heights Expeditionary Learning School (WHEELS) in NYC, a father, daughter, and teacher sit together at a table. Unlike a traditional parent-teacher conference, the spotlight here is on seventh-grade student Gabriella Perez as she explains the standards-based learning target she is working on and shows evidence of her progress. "I'm really proud of explaining what context clues are," she shares, and points to a piece of work from her portfolio that supports her self-assessment. Her father, Miguel, identifies this student-led conference -- and his partnership with his daughter and her teacher -- as critical. "It's very important to have these conferences, especially to learn -- to see -- where our student stands as far as academics are concerned," he says, "and it also helps us get involved in the education of our kids." The student-led conference (SLC), which takes place three times per year at WHEELS, engages students and their families in conferences at which students communicate their progress toward both academic learning targets and habits of scholarship (such as persistence or time management). During SLCs, students share portfolios of work and discuss progress with their families. The students facilitate the meeting from start to finish. These conferences provide a consistent hub to bring families into the school environment to learn about their students from their students. They also provide the opportunity for families to contribute to students' achievement, because the conferences position family members as key supporters in their child's schooling. Differing from the traditional parent-teacher conference, the SLC places students solidly at the center of the conversation to talk knowledgably about areas of growth and challenge, and to collaboratively set goals with their teacher and family member(s). The conference recognizes students as agents in their education supported by teachers and family. How can schools like WHEELS, a K-12 with a high English-language learner population, create powerful and consistent family engagement in student-led conferences? One priority is to be very clear about expectations with faculty, with students, and with families. Because teachers and students diligently prepare for SLCs in advance by reflecting on projects verbally and in writing, culling work that represents progress or challenges, and giving and receiving feedback, the investment from students can have a domino effect on family participation. Teachers and students are excited about family engagement because it represents the authentic experience for which they've prepared. Families recognize their value as co-pilots in students' education, realize that the school values them as partners in their child's learning, and come to see themselves as contributors to the overall success of the school as well. Ensure that language is not a barrier. With a high percentage of ELL students and families, WHEELS identifies volunteer translators among grades 9-12 students for those teachers who don't speak the home language of families. Use the term "family" intentionally. As students' parents are not always their primary caretaker, we're sensitive to the likelihood that other family members will attend the SLC. Identify one teacher (advisor) as point person. At WHEELS, the Crew leader, like an advisor, works throughout the year to develop friendly relationships with a small group of students and their families. This relational trust supports communication before, during, and after the SLC. Practice flexibility and persistence with families. If a student's family has an extenuating circumstance, teachers encourage an extended family member to attend the conference or offer to schedule it for a different time. SLCs have even taken place over the phone. Teachers do not stop calling families until the SLC occurs. Promote opportunities for families to ask questions about a student's progress. During the SLC, families have the chance to offer their insight into their child's development, providing the teacher a more holistic understanding of the student to better support him or her. The SLC is an opportunity for teachers to share how families can support their child's development at home. Families want to support their child outside of school and welcome new ways to engage in their learning. Instill a sense of shared ownership and pride. Families are proud to see their children present work and talk about their learning. As Miguel Perez maintains, "I think the SLC boosts the kids' confidence because it shows how they can talk to their parents about their work." Student-led conferences offer a key structure for families' involvement in their child's learning. Through SLCs, the adults who care about these children engage in a process that honors their growth while simultaneously honoring families as partners in students' progress and a school’s success. As WHEELS senior Erica Cabrera affirms, "During SLCs, I take charge of my own education and progress. Through SLCs, I have learned that my family members and Crew leader [advisor] can support me along the way if something feels challenging."